Cumulative index. Tables of contents. 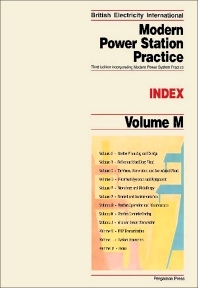 This volume contains two additional features which enhance the value of Modern Power Station Practice as a whole: a cumulative subject index and a detailed list of tables of contents for the entire work. The cumulative index provides access to the vast body of information presented in the set, and also indicates at a glance the breadth and depth of the treatment through the use of inclusive page ranges for major topics. In order to allow the reader the greatest flexibility in using the index there are many cross-references. The entries themselves are qualified by up to two descriptive subheadings to allow the most detailed coverage possible of the subject matter. The reproduction of the tables of contents for each volume also provides an overview of the organisation of the individual volumes.